This is an actual photograph of her. It’s not one of those ‘borrowed-with-permission’ internet image like the ones I usually use. This really is my Trampoline Cat. I think it helps that you are able to see her in her domain and know that she’s real and that I’m not making her up, like I sometimes do with stuff. She arrived in the Summer, back when it was understandable. We’ve had the large trampoline in our back garden for quite a few Summers now. It’s been a very successful addition. Even this past Summer, when the guys might have considered themselves too big and mature for Trampoline japes, they would sit out there with their friends long into the gathering midnight dusk and drink Dr Pepper and chat and laugh about God knows what. Instead of the frenetic action place it had been in earlier years, the trampoline has now become a place to recline and consider. It's maturing along with us, I suppose. So, yeah, it’s been good. Then, one Summer’s day, the Trampoline Cat took up residence. I first saw her out of the bedroom window on a July evening. There was one corner of the trampoline where the sun still managed to reach and the cat was there, legs folded under, eyes closed, enjoying the soft base and the sunlight. Our trampoline has a very high protective mesh screen all around it and a single tent flap area where you can climb in and out. Once you're in there, you feel quite enclosed and protected. It’s kind of nice. I guess the cat thought so too. After that, the cat came every evening to bask in the last of the sun and kick back for a while. I liked it. I like cats but I have a skin allergy to them such that, if I stroke one, I will generally pay the small price of a bumpy rash for a few hours. (I can feel an itch now just writing about it). So, yeah, although I can’t go around being all tactile with them, and I obviously can’t own one, I do like cats. Even saying that… ‘like’ isn’t the exact word. It's more like I ‘admire’ them, their power and independence, their attitude. We’ve had lots of cats come through our garden, over the years. They’ve come and gone but the Trampoline Cat seems a little more special. She seems comfortably proprietorial over her trampoline spot. She seems relaxed and at peace there. There’s an element of a little rest being offered to a traveller upon the road and it’s rewarding to be able to do that. It was obvious why the cat chose the spot she always sits in. As I mentioned, there’s the soft bouncy base and the last of the sun to be enjoyed. But the sun went from the trampoline as the Autumn extended and still the Trampoline Cat returns and returns every day to sit a spell on the very same spot, even though it's now in shadow and a bit cold. We are all creatures of habit, I guess. I’m writing this because I was up pretty close to the cat on Friday at lunchtime. I raced home from work to hang some clothes out on the washing line (‘Domestic God’, I know) and the cat was there, in the usual spot in the trampoline enclosure. I had to go really close to hang the shirts on the line and the cat eyed me in a highly relaxed and superior fashion. I took the photo as I was finished with the hanging-out and I resolved to write a few lines about her. So here it is. I like the Trampoline Cat even more today than I did before our Friday encounter. Here’s the simple reason why. As I described above, the trampoline has only one way out of it, through the mesh ‘tent-flap’ entrance, and I had that effectively covered while I was at the washing line. 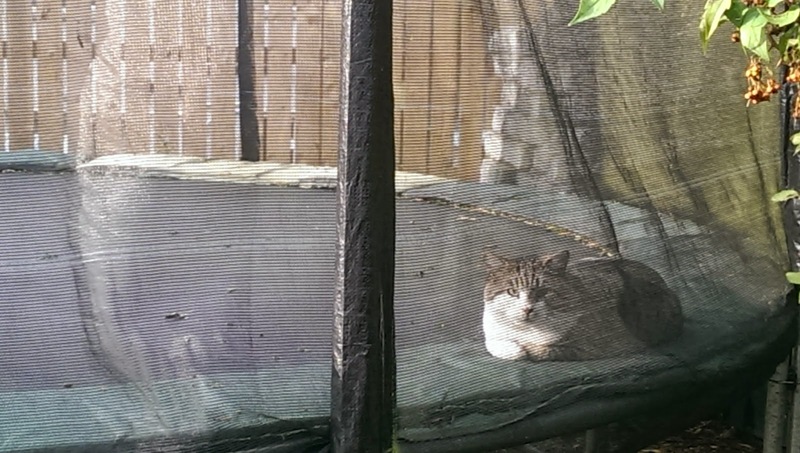 The mesh around the perimeter of the trampoline is very tall and offers no way out for a resting feline. I effectively had the Trampoline Cat cornered and trapped. But, here’s the thing, the cat didn’t seem to mind at all. It seemed to trust me. Therein lies the rub, the one I cannot give to the cat. I like the cat more because it seemed to trust me. So keep calling, dear Trampoline Cat, you’re always welcome here. The sun will come around again soon enough and, with a little luck, we’ll all bask in it then. I miss not having a cat. My neighbour has two and every now and then she asks me to take care of them while her and her fiancée (no, I didn’t spell it wrong, they’re both girls) go and do stuff. Last time it was for a week and twice a day I got to go in and attend to their needs. They’re called Bailey and Harper. Bailey is the older of the two. They had her first and then brought in the kitten and she’s never been the same since. She used to purr her head off when I came over but although she’ll tolerate a little petting mostly she keeps to herself these days. All she needs me for is to turn on the kitchen tap for her—she’s got me trained—and that’s it and the wee one’s constantly trying to muscle her way in but that’s our thing and so I shoo her off. If I pet Harper—or it might by Hayley (they’ve a dog and I think she’s called Harper)—then Bailey wants nothing to do with me. We tell the bird when he dies we’re going to replace him with a cat. I’m not sure we will though. I haven’t been out of the house for more than a few hours since we got Birdy. He’s quite dependent in that regard. We’re a flock and he expects (needs) his flock around him. As long as he knows where we are then everything’s all right in the world. Still haven’t replaced Fishy. I scratched the front of the tank whilst cleaning it and Carrie’s been trying to fix that. She was using a Dremel but now she’s hauled some other drill-type thing out of the cupboard. I’ve no idea. I’d’ve just bought a new tank. Not very good with my hands me. Hate DIY. I do enjoy having a pet around. There’s definitely a part of me that likes to look after things (or people but things do and talk back less). I miss my daughter in that respect but if at thirty-four she still needed me I’d not’ve done my job properly. I get to look after Carrie but she’s an independent sort and that’s not such a bad thing. I like to be needed but I’m none too crazy about needy people. This is one admirable cat, so your cat trusts you. That's good. Personally though, I dislike cats. hehehe..I don't like their claws and the feel of their furs. I love dogs though. I had once a pet dog named Piper, and I cried for that dog when he died. He was one faithful and loyal dog. When I was rushed to the hospital way, way back; he stood guard at our house even without food. When we came back from the hospital, he was there at the door happily wagging his tail even if we have forgotten all about him.